Blizzard has been pretty consistent over the expansion to include a meta achievement, normally involving you doing bosses in the current tier's main raid a special way, to reward everyone that participates a unique 310% flying mount. Icecrown was no exception to this. In actuality it's probably one of the more approachable metas that has been released. It's clear the achievements are centered around having no Icecrown buff, so with the buff things are much more manageable. I had originally intended to break this up into multiple posts, but honestly some of the requirements for the meta really don't require that much explanation. A standard group that would normally clear heroic 10 man ICC (11/12) should easily be able to handle the logistical requirements for the achievements. 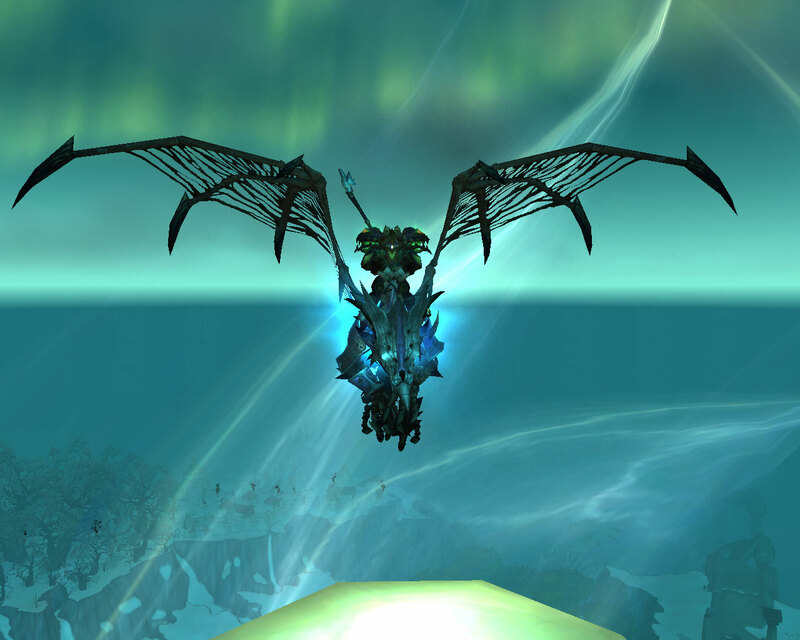 So bring your normal A-game and you'll be flying around Northrend in style before you know it. There is no easy way around this, you just need to do each boss on heroic. There are plenty of resources available on reputable sites. For a quick run down of the abilities, Wowhead works great, if you want a strategy with pretty pictures - check out Bosskillers.com, and if you need to see it to get it, check out WarcraftMovies.Com, Bosskillers.com, and of course YouTube. If anyone requests, I'll do individual strategies for heroic encounters (10 or 25) from a bear perspective. Also as I go down the list of other requirements, I'll note where it makes sense to actually go ahead and try it out on heroic and kill two birds with one stone. This achievement is relatively easy. All you need are quick switching DPS to break people out of the Bone Spikes throughout the fight. It gets a bit hairy when Marrowgar is bonestorming, but honestly the spikes don't have much health and you have 8 seconds, which should be plenty of time for even just the burstier DPS to take care of them. Easy to do on heroic, but be wary, if you fail this one and kill the boss, you'll have to wait till next week. Go ahead and switch this one over to regular. The key thing to remember for this fight is you need to have 5 of any UNIQUE mobs out. Try and get the following three adds, once they are alive put a mark on them and handle them appropriately for the remainder of the fight (tank, kited, cc, ignore). Reanimated Fanatic - Apparently you can CC them; the OT (me in the case of our kill), just tanked it. Reanimated Adherent - Tanked by OT, it's not the end of the world if this mob is focused on someone else. The damage should be healable. Once you have those three adds alive, kill remaining unmarked adds, burn the boss to 1-3% mana. When the new adds spawn, burn the boss to push her over and then mark two of the three unmarked adds (Leaving you with 5 unique adds). Kill the remaining add. You should then havea Cult Fanatic and Cult Adherent joining the other 3 unique adds listed above. When this is true, it's just a matter of burning the boss down as quickly as possible. It might be wise to just use one tank on the boss, if most of the DPS have aggro dropping abilities. Using tricks and misdirect on cooldown should help the main tank build enough threat to last most of the fight even once they have the 5 stacks and aren't generating threat anymore. Also if you do have a paladin tank, they can MT and once they hit 5 stacks then can Divine Sacrifice the debuff off and as long as they do it quickly they can get the boss back no them with a taunt. This is one of the harder achievements for the meta, it might take a few attempts to do it. It just takes a strong understanding of the boss mechanics, patience, and a bit of good luck. This is easy, and can probably be done on heroic as long as the two people using the guns (cannons) are quick to get in and start doing damage. You should have 4 mages which means 2 trips for 4 unique people. Essentially split the group into two. The healers don't really need to jump over being that they can heal the tank that does jump over from the boat they are already on. The tank jumping over just needs to make sure they tank the boss close to the edge so they are in range. Easy group has: 1 tank, 3 DPS. The first group jumps over twice, while the second group stays on the ship and either handles the adds or gets ready to jump in the guns as soon as they are unfrozen. Once each group has done it's thing twice, they simply switch roles. The second group jumps over twice, while the first group handles adds/guns. Simple as that. If you do this on heroic, be aware that it will be really close for the last 5-10%. It will almost seem like the mage is about to freeze the guns and ruin your chance of getting the other boat down, just have the gunners burn and you should be fine. Essentially just doing this boss the way you are supposed to should net you the achievement. Just do everything you normally would to ensure Saurfang does not get any (much) blood power. You can probably do it on heroic as well. Quick taunts between the tanks and solid DPS/control of the adds, just like a normal kill. This one is relatively straight forward for a heroic ICC group. I wouldn't suggest doing the fight on heroic, as Vile Gas may make it a bit tougher, and you want the boss to go down quickly. Essentially the way we did it was the first two oozes were combined as usual and than picked up and kited by the OT (me) using Faerie Fire/Growl if needed. Once the third ooze spawned, it was held until a fourth spawned. These two were merged and then again kited by the OT (me). Switching between the two large adds with Faerie Fire is normally sufficient. The remaining oozes that spawned were merged with one of the big oozes, and by this time the boss had already died so there was no concern over the big ooze getting too many stacks and exploded. This achievement is really simple, but I still suggest doing in on regular only because the boss will probably die around the 5th-6th ooze. Really simple achievement. Can probably be done on heroic, but again, you want the boss to die fast just like Rotface and not dealing with maleable goo is nice as well. The first two people that get the spore run out of the raid away from everyone and each other and have the spore explode on just them. The second two people that get the spore, do the fight as normal, one ranged and one melee spore. Everyone EXCEPT the first two people that got the first round of spores stacks up and gets their first spore. The first two people run out ensuring that one the second round of spores explodes they still only have one stack of Inoculated. The last round of spores, everyone gets, so basically just do the spores completely like normal. One ranged and one melee, and everyone gets it. Everyone should have two stacks of Innoculated by the time Festergut casts Pungent Blight, and everyone should be able to live through it with two stacks. By this time the boss will probably be near close to dead, so finish him off and congrats, only 6 more achievements to go! Probably a wise idea not to do this on heroic. Basically whoever controls the Abomination in phase one and two, can't slow the slimes down. Simple as that. Orange is a bit tougher to deal with being that it moves relatively quickly, but everyone just being aware and burning the add down quickly should make this achievement very manageable. Make sure you have clean transitions between Phase One and Two, and Two and Three. The thing to remember about this achievement is there are very few things in the encounter that hit for 23,000+ damage. The two big ones are Empowered Shadow Lance and Empowered Flame. The first of these should already be inherently handled by the tank on Keleseth. For our kill I was tanking Keleseth and pretty much always have 4+ orbs on me when Keleseth is empowered so there is never really any threat of getting hit for 23,000 damage in one hit. The other ability to worry about and really the only one, is Empowered Flame. You need to ensure people are running along with the Empowered Flame to weaken it before it reaches it's intended target. This is exactly what should be happening anyways especially on heroic so there really aren't any changes to this fight. We did this on heroic because the abilities that count should be handled appropriately or they will kill you and/or fail the achievement regardless if they are the heroic or non-heroic version. The only difference here being the boss has more health on heroic leaving more time for a mistake, so consider regular just to make it that much easier. Really simple, and will take at least two weeks. The key for this one is to ensure you have enough people that still get bit every week to kill the boss. Should not really pose too many issues and most people are half way done with this achievement by the time you are working on the meta anyways. Doing it on regular definitely helps, it drops her health by something close to 4 million, which cuts down the fight length considerably. You need three healers for this achievement. One to stay outside and heal the raid per usual. Two that take two of the portals. And then you'll need one DPS to also take a portal. The fight is per usual, just make sure you call adds out to make sure you don't fall behind, being partially down one DPS, and communicate which portal you are taking if you are taking one. The first week we actually failed this achievement because we pushed the boss to 100% at the exact same time portals spawned and since no one had a chance to get into those portals, we missed the achievement. So be aware of that. Also I suggest doing this on regular for the achievement, it's not particularly harder, but it just makes adds more manageable being down a DPS. This is definitely a bit harder than most of the other achievements for the meta. I wouldn't suggest doing this one on heroic. The key here is in phase three. Everyone must clear their stacks every ice block. The biggest cause of concern is your tanks and their debuff stack. The best way we found was to use the first block that got put down for both the tanks at the start. Essentially the first block is dropped and the OT clears his stack. Once he has no stacks he taunts Sindragosa and the MT uses the same ice block to clear his stacks. Then the first block is burned down quickly. This helps deal with the fact that pretty much all through phase three your tanks are going to be right around 4-5 stacks by the time they clear. So a Blistering Cold or misstep when trying to clear could fail the achievement and require you to wipe. We did use the strat of flipping her 180 degrees for each tank taunt which keeps the blocks separate. The tanks should still have enough time to get behind the block to clear. This fight is really just about flawless execution on the tanks part. We got it on our second attempt and I think the main reason was staggering the first block to help both tanks get on even ground at the start. A relatively easy achievement and obvious one you'll be doing on regular. The plague that Lich King casts on people throughout phase one is the key to this achievement. Every time the plague jumps to a new target by either killing it or dealing damage needs to stack to 30 before you transition to phase two. A couple of things to be aware of and/or make this achievement easy.. The first plague that is cast should be run out of the raid and dispelled away from everything (including the ghouls/shambling horror). The reason for doing this is so when the plague is stacked really high and one shots anything it does tick on, the OT won't run out of ghouls before it reaches 30. This becomes important close to the 22+ mark. If the OT runs out of mobs and gets the stack, you can still do the achievement if you have a DPS stand next to the tank and bounce the plague between them. This will only work for one or two ticks though because every time the plague is dispelled it loses a stack, and you will be digging yourself into a ditch. Because of the second point. Every time the plague jumps or deals damage it gives the Lich king a stack of his buff, which increases his damage significantly. Right around the time you hit 30 stacks is where the Lich king will have 30+ stacks. The damage will be just barely healable by then on the MT, so it's really important to have the Lich King really close to 70% so, as soon as you are around 28+ stacks you can have your DPS push the Lich King to phase two. The remain adds should get the plague to 30 and now it's just a matter of killing the Lick King like normal. Congrats on your drake, be glad you don't have to kill Lick King on heroic to get it. Now go take some pretty pictures!! Full House is THE most horrible achievement. People were killing the wrong thing or we left too many of the same kind alive and no one knew how many adds we had up at any given time and I was on the verge of a nervous breakdown that entire fight. That fight can go bone itself. Full house is only hard if your DPS are baddies.